The present document is a deliverable of the Residue2Heat project, which is funded by the European Union’s Horizon 2020 Programme under Grant Agreement 654650. The document presents the first version of the project “Data Management Plan”, describing the implementation measures envisioned to efficiently manage the research data gathered in the project. This Data management plan is part of Work Package 8 – “Communication, Dissemination and Exploitation of Results”. It will be reviewed and updated yearly. This deliverable outlines how the collected or generated research data will be handled during and after the Residue2Heat project is finished. 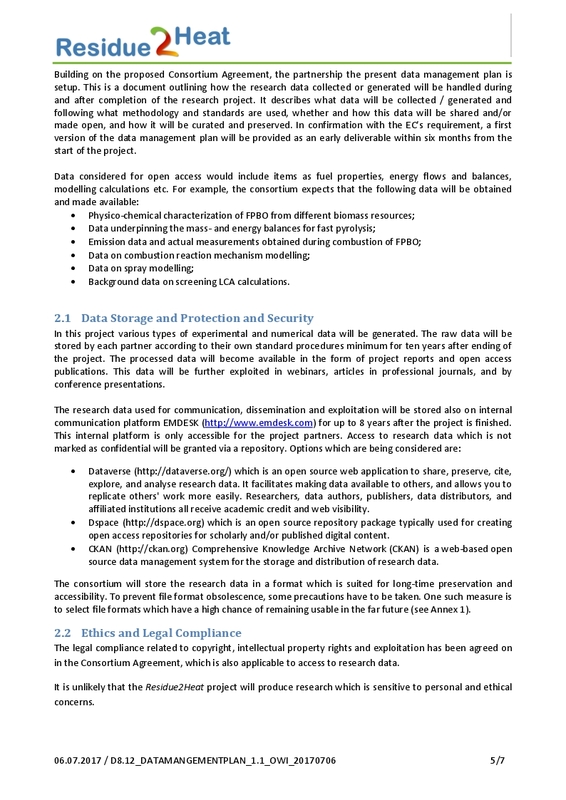 It describes which standards and methodology for data and generation of research data will be followed, and whether and how data can be shared.